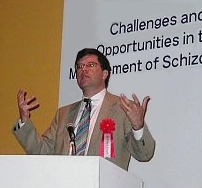 Gateway Psychiatric Services organized and hosted a half-day symposium for 100 primary care physicians in Honolulu in June of 1999. This continuing medical education event was sponsored by the Institute for Behavioral Healthcare, the Hawaii Medical Service Association, and the University of Hawaii’s Department of Family Practice. Gateway Psychiatric Services for Mental Health Medical Directors, Medical Directors, and their IT Staff at the Sterling Hotel in Sacramento, California on Friday, January 12, 2001.